The GT-7000 is a hand held, gun-type CCD scanner that features "laser-like" performance. 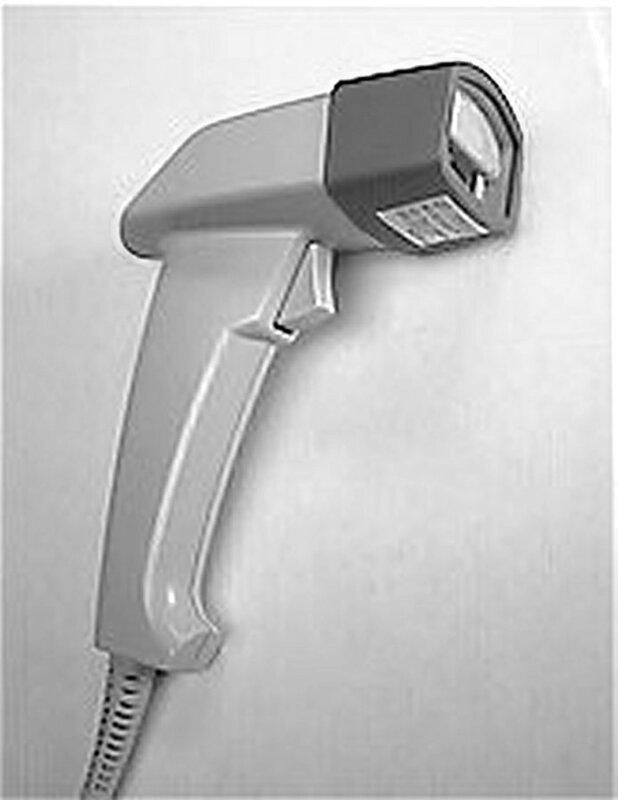 Unlike conventional CCD scanners, it is no longer restricted to operating very close to the barcode. Unlike lasers, it has no moving parts and requires no safety precautions. The barcode is illuminated using red light emitting diodes. The CCD used in the unit is similar to that in digital cameras, and takes a picture of the code rather than scanning it. The scanner takes 45 exposures per second, equal to the scan rate of most hand held lasers. The GT-7000 offers USB, keyboard wedge and RS-232 interfaces. The unit reads all common barcodes and is easily set up to operate in most any applications by scanning barcode menus. A unique system allows copying setup parameters from one scanner to another. The extensive data editing capabilities, built into the scanner, minimizes programming at the host computer end. The Keyboard Wedge and USB models are normally used to add a barcode "front end" to existing applications. If these applications normally accept input from a keyboard, this scanner enables the use of barcodes without any software modification. Data from the scanned barcodes appears as though it were typed on the keyboard. The RS-232 model can connect to the COM: port of a PC or any other device designed for EIA/TIA RS-232C communications. Baud rates of up to 38,400 are selectable. All models feature extensive data editing. Barcode data can be reformatted, function keys can be inserted and delimiters or other special characters can be added to the barcode label data. 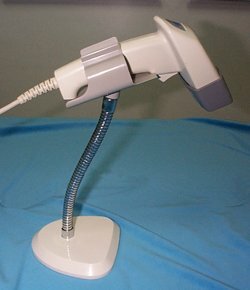 An Accessory Stand is available for "hands-free" operation. Code 128, Code 93, and MSI/Plessey. RS-232:         Selectable baud rate from 300 thru 38,400.
identical to a keyboard wedge scanner. USB Model is furnished with a Type A connector. The maximum distance between the scanner and the barcode is a function of the density of the barcode. Density is usually measured in terms of the width of the narrowest bar or space in the code. In general, the wider the bar or space, the further away the scanner can operate. The distances below are typical for this scanner.